Over in the UK, Lay's Potato Chips are known as Walkers Crisps, and they have the Do Us A Flavor contest there too. Several folks, including a recent episode of The Nosh Show (it's also the episode where they try the US DUAF competitors), have brought one of those flavors to my attention. It's called Ranch Raccoon. Yeah. Let that sink in for a moment all you who thought Cappuccino and Chicken & Waffles were a bit much. Ranch. Raccoon. Here's how the fine folks at Walkers describe this flavor: "A delicious combination of gamey meat flavour, with accents of sour cream and a garlic kick. They compliment one another beautifully." 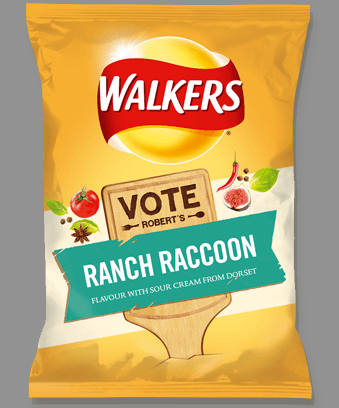 The flavor came from the mind of one Robert Gibson, who initially rejected ideas like 'Doughnut Burger,' and decided that if Cajun Squirrel (apparently a real flavor) worked, why not Ranch Raccoon? Wow. I have no words. 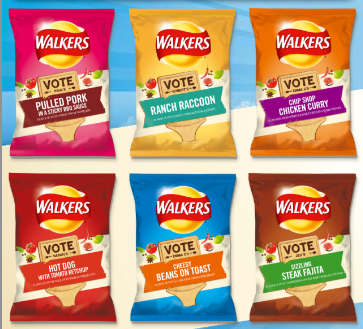 Ranch Raccoon is up against some pretty stiff competition in this year's Walkers Do Us A Flavor, including Pulled Pork in a Sticky BBQ Sauce, Chip Shop Chicken Curry, Hot Dog with Tomato Ketchup, Sizzling Steak Fajita, and Cheesy Beans on Toast. Well, if there's one thing I can say for the Brits, it's at least they had some fun with the contest. And I think it's also worth mentioning that Pickled Onion, Roast Chicken, and Prawn Cocktail are all regular flavors for Walkers Crisps. Would you try any of these flavors? Glenn, what happened to those of us who really like the potato flavor?? Now they're adding meat and ohmygosh seasonings to the poor chip. Yikes! Thanks for sharing this new bit of news.